Join ArlingtonWeaves for live loom demonstrations and learn all about the weaving process, textiles and tools at this hands-on event. ArlingtonWeaves, Etc. #AWE(some) is a non-profit entrepreneurial weaving program that is funded by the Arlington County Department of Human Services and implemented by ServiceSource. 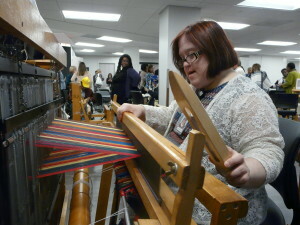 ArlingtonWeavers are textile artist that have learned the process of weaving to produce hand crafted woven art and products that fuse innovation with unique weave structures that are practical and functional. AWE artistians receive 100% of the proceeds from the sale of their woven art.